OK, so I love Italian food.... not only because of the fresh pasta, the good extra virgin olive oil, the wines, the cheeses, etc.... but also the production of it all - preparation of this food brings family & friends together to break bread & enjoy. When flying into LaGuardia Airport for visits home to Connecticut, our route takes us through the Bronx and we make time to stop at the authentic Italian neighborhood - Arthur Avenue. Mmmmm, I am imaging the aromatic scents that flow out of the storefronts and onto the sidewalks inviting you in - maybe a regular slice (code word for cheese) of just out of the oven of pizza or the perfume of grinding espresso for cappuccino - these streets are lined with original family run shops - a butcher, a pasta maker, the bakery - where you can pick up the the freshest provisions needed to please any appetite! 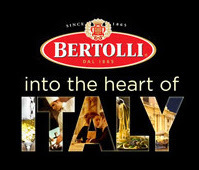 My next visit to Italy maybe a while off, but I have loved watching these short foodie videos that Bertolli - maker of Italian products found in your grocery - is offering for view on their website. Into the Heart of Italy follows 3 Italian Americans, all faces you'll probably recognize - Dan Cortese (Seinfeld & MTV personality), Rocco DiSpirito (noted restaurant chef & cookbook author), and Marisa Tomei (Oscar winning actress). This energetic trio makes their way to different Italian cities on a foodie scavenger hunt of sorts, along the way relishing in the breakthtaking sights & landscape and feasting on the local cusine. Click here to watch the first of 6 webisodes. Ahhh, Bellissimo!